A recent study revealed that only 37% of adults in the United States actually made it to the dentist office for a cleaning and exam in the last year! At Times Square Dental, we’re more committed than ever to keep you from being in that 37%, especially if what’s keeping you from the dental treatment you need is fear! Dental anxiety is one of the top reasons people suffer from poor oral health. That’s why our Boise, ID dental team wants to let you know how overcome it in two easy steps. If you’re ashamed about how far you’ve let your oral health go, then you might assume you’ll get a finger-wagging lecture from Dr. Hastings or Dr. Dial. But you don’t ever have to worry about that at Times Square Dental. Dr. Hastings and our team want nothing more than to give you a positive experience. So we keep the atmosphere in our dental office lighthearted, fun, and friendly. Expect no lectures, judgment, or shaming from us… ever! Maybe you’re afraid of what the dentist might discover during your dental exam. It’s natural to fear painful procedures, especially when you have no idea what sort of oral health issues you might be facing. We can gently numb you for any necessary procedure. We can also let you choose from three different forms of sedation that suits your level of anxiety and the treatment you might need to restore your oral health. It’s not easy giving up control to someone, especially when that person has all kinds of scary tools to use in your mouth! But, we must assure you that Dr. Hastings, Dr. Dial, and our caring hygienists do all we can to make sure you know what’s going on during your appointment and that you feel comfortable with each step. This may be the toughest one to overcome for patients. We can understand why. Childhood traumas of any kind will stay with you for the rest of your life. But it may help to know just how much dentistry has changed since you were a kid. Not only can we assure you of our warmth and compassion every time you’re in our care, but with our advanced technology and sedation options, you really have no reason to fear similar negative experiences like you may have had as a child. One of the most heartbreaking things we see as dental professionals is how avoidable poor oral health is to patients who just aren’t aware of the help that’s available to them. The truth is that sedation dentistry has become more and more a top priority for dentists across the country who see the effects people suffer because of their anxieties about dental care. Our team at Times Square Dental is one of those practices. We’ve gone so far as to become extensively trained and certified to offer the highest level of sedation available to our patients. IV sedation is incredibly effective because it puts you in such a state that you’re so peaceful and relaxed that you’re not likely to even recall your appointment. If your dental anxiety isn’t quite as intense, then you could also opt for nitrous oxide or oral sedation. Either of these two methods are just as successful in helping patients build confidence about dental treatment. It is possible to have a healthy mouth and a beautiful smile again. 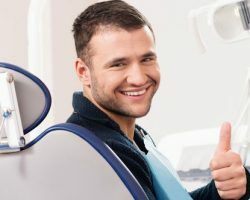 By getting to the heart of what’s causing your dental anxiety, and by taking advantage of sedation dentistry, you can eventually become comfortable and confident enough to keep up with routine dental appointments. This is the best way you can keep your teeth and gums strong and safe for the rest of your life. And Drs. Hastings and Dial, as well as our caring staff, are all here to support you as you get beyond dental anxiety for good! Call our Boise, ID dental office today at 208-278-1069 or fill out our convenient online form to schedule an appointment.